People have been culturing and experimenting with plants for millennia, but the game has now been changed. Thompson & Morgan have created a hybrid plant that grows both tomatoes and potatoes at the same time. They've dubbed it the "TomTato." Imagine: You can create french fries and ketchup from THE SAME PLANT. Really, this isn't the first time that these plants have been created, but it is the first they'll be mass sold. They cost about $24 a plant. They can even be grown as a potted plant — they don't need a full yard to produce what the company claims is about 500 cherry-sized tomatoes. They only last for one season though, so you need to buy more every year. This isn't likely to be a viable commercial crop for agriculture, but a cute novelty plant in your neighbor's garden. The plants are created by a process called grafting, meaning they aren't hybrids of genetically modified organisms (not that there's anything wrong with GMOs). These grafts can be difficult because the stems of the two plants have to be exactly the same size for it to work. Generally, it involves cutting the top plant into a V and inserting it into the bottom plant's stem system, then bandaging it up and hoping for the best. If successful, the vascular system of the plants — which are essentially their blood vessels — will grow together so the two halves can talk. That's some Frankenstein stuff. Grafting is frequently done on plants like wine grapes and apples, but that's usually just from the same species of plant. Luckily for french fry gardeners, the potato and tomato are actually closely related. They come from the same plant family and have the same number of chromosomes, the structures that hold DNA. From these specially grafted plants you can harvest both tomatoes and potatoes - a concept which has been talked about for many years, but this is the first time plants have been successfully produced commercially. The tomatoes are sugary yet tangy with a brix of 10.2, and below ground this plant produces delicious, versatile potatoes - ideal for boiling, mashing, roasting, baking or for making chips. A similar product, dubbed the "Potato Tom" launched in New Zealand this week. 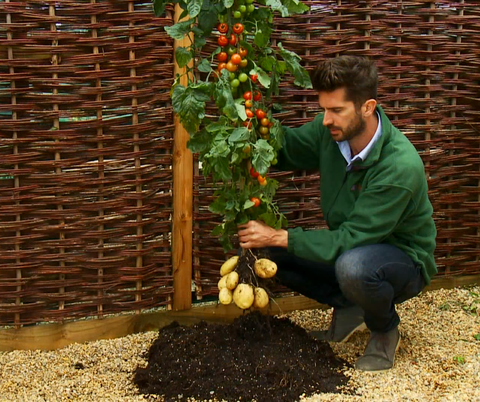 Here's a video of the TomTato — those tomatoes and potatoes do look pretty tasty. Sadly, they are only available in the U.K.